Home > What are Elder Flowers and Berries Good for? What are Elder Flowers and Berries Good for? There are a number of varieties of Elder that can be found in moist shady areas throughout the United States. Most often seen as a large shrub there are some varieties that grow to twelve feet and appear as a graceful delicate tree. Elder, in ancient times, was an emblem of sorrow and death. Used in a ceremony in the fall…it was considered extremely powerful to use the twigs of elder in Fall fires to give honor to our ancestors. The wood, however, should never be harvested in haste. Reverence should be given to the plant as it is cut or bad luck will follow. A fussy plant indeed!!!! Lore has it that the Holy Cross was fashioned from an ancient Elder tree. Whether using the large umbrella-like flowers, a bunch of berries, the leaves or twigs; medicinal, magical, and ripe with historical uses, this ancient plant is beneficial to those who are attracted to use it. The Elder plant is likely to now become popular among herbalists and consumers looking for alternatives as we go into the flu season. Not only do we have the seasonal flu but, also, the H1N1 swine flu virus to deal with. I use this potent plant as my greatest ally in keeping my body strong and resistant to disease during the fall and winter months. Elder is an excellent anti-inflammatory for the immune system, the intestinal tract, the joints, and the respiratory system. All parts of the plant are used including roots, twigs, bark, flowers, and berries. There are a number of different ways to make use of this potent plant. 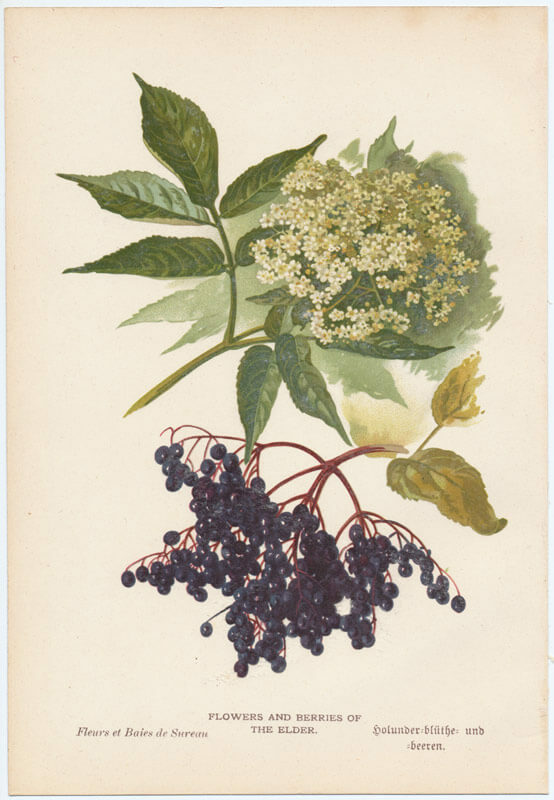 A strong tincture of Elderberries lightly heated with honey creates a highly beneficial syrup for coughs and colds. If prepared properly this remedy is excellent for adults and children. Take care of your beautiful skin. The flowers have long been fashioned into a summer beverage. Infuse into vodka or soaked in wine, combined with honey and a fizzy water and pour over ice. The berries used as a fall and winter beverage are excellent for immune and respiratory health. Birds who dine on the ripe berries will appear “drunk” as they seem almost unable to stop eating them. In an herb class, I once observed a bird lying at the foot of a large elder tree completely overcome with the effects of the ripe berries. The root and bark are powerful purgatives and should be used with caution. The bruised leaves decocted into the water and used in a spray bottle works well to keep aphids off of flowering plants. The bruised leaves, attached to a hat in the summer, are said to ward off gnats and mosquitoes.